From the Shed- Ruined European house. 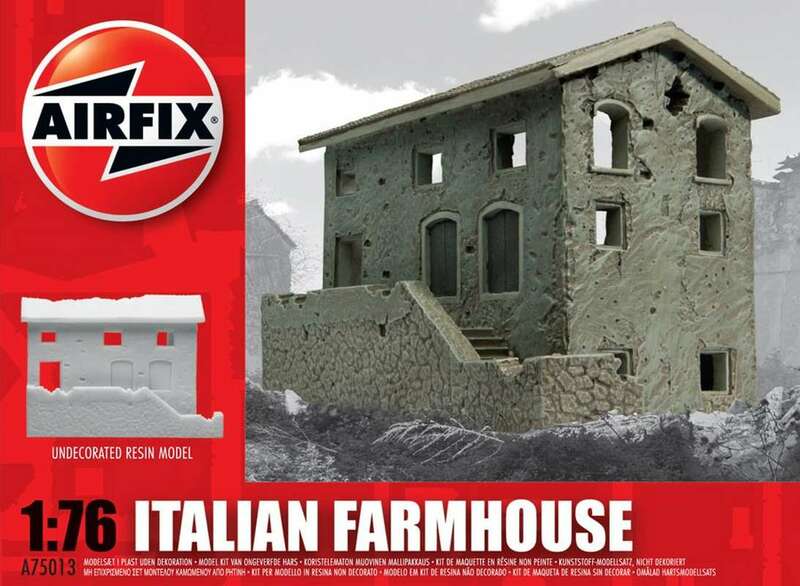 Evan was kind enough to gift me this Airfix ruin a good few years back… it had been sat in my shed for ages with me looking at it thinking I should reaaly gt round to doing something with it. I was a little put off by the very square looking blast hole but it is a lot less pronounced now it is painted. Detail was added with filler, cat litter and match sticks. I decided that the lower levels were too small for my fat fingers so filled them with rubble. Painting was done with acrylics as usual. It will be a nice addition to my NW Europe terrain set up. From the Shed: 6mm terrain. I picked up these bits of terrain from the Leven Miniatures clicky stand at the Fiasco show last year and have just got round to getting them painted. A nice collection of storage tanks to add to and industrial area. This is sold as the police station but to my eye it should work as any office block really. I kept the paint scheme neutral for that reason. The TV station. The bit with the antenna coming out of it is removable, which adds flexibility to the piece. I picked up two packs of Portacabins as I figured they’d be useful at add to other bits. I painted up this pair to see what they were like. This pair of oil ‘nodding donkey’ pumps were from Perfect 6 miniatures clicky (sold through Leven at shows). All of the pieces were very well cast in resin with a nice level of detail and a pleasure to paint up. They should be good for my 20th century 6mm set ups. I’ve always enjoyed making terrain- much more than making kits or painting figures. I guess that like many children of my era I harboured the ambition to go into special effects model making all of this came from repeatedly watching the original Star Wars trilogy… anyway enough nostalgia. Our group has been dabbling with SAGA the dark age skirmish game. Whilst the majority of my terrain is for 20mm twentieth century gaming and as such the buildings will be of no use for 28mm early medieval set ups the trees and river will be fine. Accordingly we needed some suitable buildings. I bought an MDF kit from War Bases to try out some techniques with before building up a whole village. I like MDF buildings a lot- but only the cheap ones… I think that they need a lot of work to get them looking right so I don’t see the point of spending a lot for detail that I’ll just cover up afterwards. As such I just see it in the same way I look at my own designs cut out of foam board. If you look on War Bases’ site you’ll see how plain the kit is. Here it is after I detailed it. Balsa wood and filler (spackle) were used on the walls whilst a towel was cut up to represent the thatch. I’ve previously used teddy bair fur but was unhappy with it, hence me trying towelling. Here it is finished. Respendent in many shades of sandy brown. Moving forward a couple of centuries I’ve decided to get a urban UK set up going, based on a couple of on-a-whim purchases at the local model shop. I want to game some Winter of ’79 type game (think late 70s civil war in the UK, popularised by a blog then published as a ruleset). To be fair it wasn’t that much of a whim as I was half looking for them- I’ve recently been sent a very nice detailed, almost RPG set of rules for the setting that I want to try out. I went for card railway models from Metcalfe models as they have just the right look of red brick terraced housing, I bought the basic terrace and a corner shop. The kits are quite involved, each one took a couple of hours to do. That said they are very well designed and make for a sturdy construction when finished. I’ve put up a few pictures of their construction so you can see how they go together. I can see myself building a lot of the basic terrace to fill the table in the way I want.